WASHINGTON, Jan. 16 (Xinhua) -- U.S. Secretary of State Mike Pompeo wrapped up his eight-day visit to the Middle East earlier this week, a trip the U.S. experts see full of rhetoric that can hardly regain regional confidence in Washington. 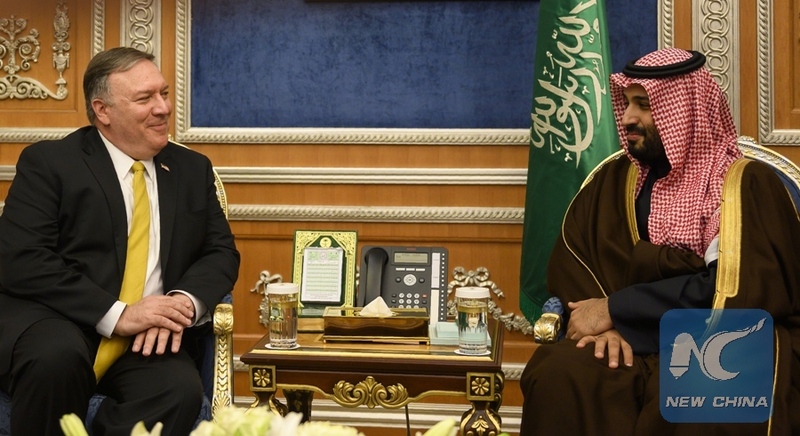 The tour through Monday brought Pompeo to Jordan, Egypt, Bahrain, the United Arab Emirates (UAE), Iraq, Saudi Arabia, Oman and Qatar, skipping Kuwait due to his personal reasons. During the tour, Pompeo emphasized the U.S. confrontation with Iran, tried to reaffirm U.S. presence in the region despite planned American troop withdrawal from Syria, and endeavored to unite Arabic countries plagued by internal conflicts. "It's hard to see any concrete forward movement on any of the issues that he was promoting," David Pollock, a senior fellow at the Washington Institute for Near East Policy, told Xinhua. The credit Pompeo could be given was that he at least reestablished "a kind of closer U.S. connection with all of those different countries," the expert noted. For Darrell West, senior fellow at the Washington-based Brookings Institution, the top U.S. diplomat just "took an American First line in the Middle East." As Pompeo made it clear that Iran will continue to be the preoccupation of President Donald Trump's administration, there was little sign showing that the regional countries were ready to side with Washington. "The Middle East has so many cross-currents," said West. "There are conflicting interests and local agenda that are hard to corral into a single narrative. The President has not yet been successful at getting all the relevant countries to unite against Iran," the scholar commented. Experts also doubted how effective Pompeo's trip was in comforting the allies after the U.S. decision to pull troops out of Syria. It is still hard to say if Pompeo "achieved any of his goals related to assuring his hosts about American reliability post-Syrian withdrawal," said Wayne White, former deputy director of the Middle East intelligence office of the State Department. "They listened, asked a few questions, but probably remained unconvinced that the erratic Trump White House could be considered reliable, especially at times when it was beleaguered domestically," White added. Dalia Dassa Kaye, director of Center for Middle East Public Policy at the RAND Corporation, agreed with White. "Given continued confusion about the direction of U.S. policy and gaps between rhetoric and actions, it is still unclear that he (Pompeo) succeeded in restoring confidence in U.S. leadership," Kaye said. Meanwhile, the troops' exit has been interpreted as signaling a U.S. "lack of interest" in the region. It has become increasingly clear that Washington has been shifting its focus away from the Middle East, said Pollock, adding that the tendency also reflected the U.S. public and Congressional opinion. "There's zero energy dependence for the United States itself on the Middle East, that's actually a reality now. And there's a rise of concern of rival powers outside the Middle East," noted Pollock. "The Trump White House's tendency toward precipitate, unanticipated moves in the Middle East such as the Syrian withdrawal complicates efforts to predict how regional developments in the region will evolve through 2020," White said.